“See-through buildings” get dumped on the market. ConocoPhillips lost $4.4 billion last year and $1.5 billion in Q1 this year. Last fall it announced that it would lay off 10% of its global workforce. Its stock has crashed nearly 50% since the oil bust began. And in February, it slashed its quarterly dividend from 74 cents to 25 cents a share. That’s the new reality. But before that reality set in, it was planning for endless growth. To accommodate the workforce required by this endless growth, it leased some office space in Houston years before it would need the space. The office market was tight, and leasing unneeded space was the thing to do. They all did it. Befuddled with optimism, oil and gas companies fought each other over leasing empty office space they might never need, and this created huge fake demand, price spikes, and a boom in development that created a flood of supply of office towers, particularly for the energy sector. They were all “warehousing” office space. With lease rates going up forever, it was hyped as the smart thing to do. But warehoused office space is the “shadow inventory” that appears on the market overnight, without warning, on top of a growing mountain of available space. Early 2013, ConocoPhillips leased the 20-story 548,000-square-foot Energy Center 3 building in the five-building Energy Center office complex and moved its Lower 48 Business Unit into it. And then it leased the neighboring 22-story “Energy Center 4” building with 597,000 square feet of space. Construction was completed in late 2015. But the floors of EC4 were never built out. The Class A tower has remained an empty shell. The Energy Center office complex also includes the speculative Energy Center 5, an 18-story, 525,000-square-foot, Class A building. Construction began in August 2014. The hope is that someone will lease it before it sits there as another empty shell. During the prior oil bust, Houston was dotted with these empty shells. They were called “see-through buildings.” They’d been built with borrowed money, and then no one wanted to lease them. As the commercial office boom unwound, it helped take down all but one of the 10 largest banks in Texas. Timing is impeccable, as it always is: the company is throwing the building on the sublease market just when everyone else is doing the same thing with their warehoused office space. 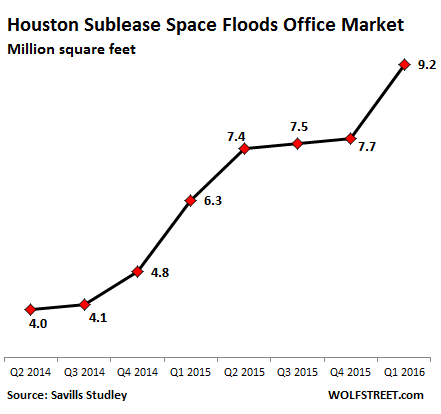 As a consequence, the Houston office market, at the confluence of a majestic construction boom and the collapse of the energy sector, has begun to melt down. Leasing activity in Q1 plunged 25% from a year ago, to 1.56 million square feet (msf), worse even than during the Financial Crisis, and is down 59% from Q4 2014! The availability rate jumped to 24.5% or 47.4 msf for Greater Houston, according to commercial real estate services firm Savills Studley. The availability rate for Class A buildings hit 26.5%, also worse than during the Financial Crisis. In the Katy Freeway sub-market, where about 90% of the office space is occupied by energy firms, availability hit 33.6% in Q1. In the Greenspoint sub-market, it hit 48%! A horrendous office glut! Unused shadow inventory, including “see-through buildings,” now popping up overnight on the sublease market is pressuring the 8 msf of new construction that remains unleased. And Q2 looks a lot worse, topped off by the 597,000 square feet ConocoPhillips just put on the sublease market. This is going to get ugly. If the Saudi devalues, Houston may just become a ghost town. Ok, that’s a little bit too much since James Harden still plays there, but it’s good bye oil for a long time. Your doom and gloom article is a bit late. Your article had an agenda that Houston is doomed and will be ghost town; not based on appropriate facts. I have been in commercial real estate here for 33 years and this business cycle’s downturn is beginning to end. My guess is you have never been here and cobbled together previous negative articles to write yours. BTW, Ron, I lived through the 1980s oil bust in Texas and Oklahoma. I’ll never forget it. MBank, one of the largest banks in Texas at the time, was my bank. It collapsed. Second largest loss ever for the FDIC. Houston recovered, eventually. But it took a long time. Some other cities, like Tulsa, may still not have fully recovered. Sure, Houston won’t turn into a “ghost town,” as NotSoSure speculated. But that was a metaphor, not a literal description. I’ll keep you posted on the developments in Houston’s CRE on about a quarterly basis, maybe with an update in between. The downturn in Houston’s CRE started about a year ago, and it’s going to last a while longer, and it’s going to get worse, before it gets better. So hang on tight. Thanks. Always looking for good data. I’ll email you to the email address you used to log in. If that doesn’t work, you can contact me via the “Contact us” tab. otherwise it’s just yesterday’s news. The Greenspoint sub-market vacancy rate will be going above 60%, last large tenant announced they will be moving out. Things are holding up thought despite all the construction going on. Residential real estate has stayed close to highs or kept going higher. 2% property tax which is normal in many Houston neighborhoods amounts to 10k a year on a 500k home, that is a lot of money before even including mortgage, insurance and homeowner association. Money that unemployed former energy sector employees don’t have. I guess I have a front row seat to whatever happens, whether it turns out good or bad. John S: I wonder if the banks will move toward foreclosure in the high dollar areas? My town of 100,000 in Alabama is fairly diversified, but the downturn of 08 had an effect. I have watched foreclosures since that time. The first several years saw foreclosures of mostly lower end properties. For the last couple of years, more of the high end properties have started showing up. I suspect a lot of folks have been living rent/mortgage free for several years in these high end properties. Or, perhaps, just paying what they could for as long as they could. As far as I know banks can’t wait to foreclose on a home with equity in it, on the other hand they drag their feet if there is no equity and they have to take a loss. In an absurd kind of way the person who put down 3% and is now underwater is actually better of, he can at least live rent free for a while. Houston is a little bit different, there is a big boom in medical services as well as sprinkling of Chinese money and with huge amounts of hope helping to keep things aloft. Another thing I have noticed is that people keep moving here even though job picture has changed substantially for no apparent reason other than because other people are moving here, it is a strange phenomenon that I have not seen anywhere else. It makes no sense to me, there are so many better places to live that have better climate, less traffic and are also cheaper. I actually appreciate these posts. It also collaborates my own observations here in the bay area. I observe quite a few see-through buildings myself. Energy is at the leading edge of this so its a good indicator. 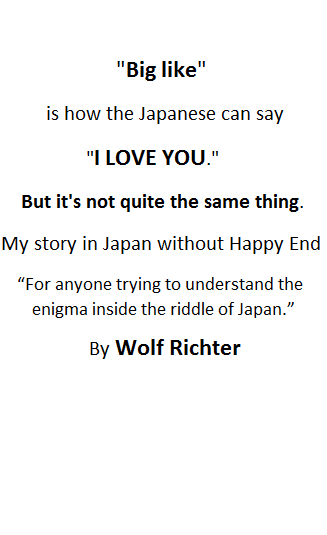 Good post, thanks Wolf, very appreciated. About 15 months ago I attended a meeting just outside Houston. Modest hotels were running $200-300 per night – absurdly high. Some smart grad students decided to rent a house via airbnb – 7+bedrooms, pool, bbq, 10 seat movie theater, massage table — a $1M+ home — for $500/night. For 6 students – a real bargain, <$100/night. The house was furnished with new furniture and decorations – looked like the owners hired a decorator to buy up cheap tacky stuff to decorate the house – no personal items – clearly an investment property – perhaps the owner was having trouble making payments – so they tapped into airbnb. But what was interesting is the entire development of hundreds of these 1M+ homes were all empty – no lights on in any house – no cars in any driveway. Made me think of China's vacant cities. Apparently the houses were all investment properties sitting vacant. That day I realized the Houston area had a real estate bubble. That’s a fascinating tidbit. I wonder how much of that is going on, not just in Houston but elsewhere. Your comment made me go back and check on the Florida rental market I left behind. The rents are even higher now than at the end of last year. Family median income in Florida is about 57K. For the median family to rent they have to find a $1600 rental. The average house, in south Florida, is at the $2400+ level. That average house requires an income of 86K to rent which is extremely high in south Florida. The only way to qualify is to double or triple up. On zillow they list the number of homes for rent in an area up to 500. I thought the available houses for rent in my old neighborhood was on the high side. Speaking of China, I wonder if those empty investment properties are owned by off shore investors? Here in Pasadena (CA not Texas) all cash Asian buyers dominate the real estate market. I’m curious if this is happening in places other than west coast cities like LA, SF, Vancouver, etc. What part of town/neighborhood was this in – do you remember? Wolf: What are your thoughts regarding the following article by Gail Tverberg? Unfortunately, Gail is a peek-oil nut. Low energy price are boosting growth in oil importing countries, which far out-number oil exporters. Cheap oil, cheap energy, is great. Add to this, renewable energy continues growing year on year, regardless of energy prices. What Growth? Where is this growth happening? News to everyone, if it is. Nicko, Gail Tverberg is not a nut at all. Expensive oil is a problem for the economy and so is too cheap oil. Expensive oil sends the economy into recession. Even cheaper oil sends the economy into recession if it occurs after an oil investment bubble (where we are now). Depends on who “we” is. If you’re an investment bank that loaned money to fracking companies and/or have a good chunk of your energy investments (including alternatives) predicated on oil at $120, then, yes, you need it. If you’re anyone else? Hell No. There’s a big auction of oil/gas equipment going on in my part of the world (near Parachute, Colorado, the center of the fracking world here) this week. I got my teeth cleaned last week and the dental hygienist, whose husband works in the oil biz there, told me things are very grim, lots of ongoing layoffs. She’s worried, as they have a big house with a big payment plus lots of toys. Just four months ago, when I last got my teeth cleaned, she was a bit cocky, saying the downturn wouldn’t hit there at all. I’ve noticed that people in the oil biz are a lot like realtors – they always say it’s not going to hit their area, even when the facts say otherwise. Very ironic that people who live in – of all places – Parachute Colorado would not be aware of the history of what the cyclical energy business can do to them. Apparently your hygienist didn’t live there in 1982. Or she just has a bad memory. ERG, she’s from Wyoming, which is even worse for boom and bust, but she’s fairly young, as are a lot of these people. They don’t study local history, apparently. I was in this area during the 1982 devastation and did quite well buying real estate for pennies on the dollar even though I was quite young. I never forgot what I saw and have always been fairly conservative financially. It was really sad seeing people lose everything. Nothing new these days, though. They are not reporting this in the Houston Chronicle. That’s also where the link in the article goes to. Homes in Katy, where many oil and gas employees reside still seem to be selling, and for higher values than last year. I’m wondering when this market will impacted. What goes uplease so rapidly must come down! Bad for oil companies and owners of office buildings, but a huge opportunity for start-ups and companies looking for attractive rates in an area with a great work force that isn’t having to miss meals to pay for housing. It’s going to get worse, a lot worse in Houston, before, or IF it ever turns around. Companies, big companies, are closing or consolidating here at breakneck speed. Expect property tax rates to escalate as property values continue to decline, crime rates to increase, population to decrease, 20% or better commercial property vacancy rate, and a severe housing glut. It’s 1980’s deja vu.